Butter beans and soya beans are fresh beans and are so popular in my hometown, Madurai. They are actually grown in Kodaikanal and brought to Madurai. I have heard that they are famous in Ooty as well. Usually, butter beans will be white-dominating and soya beans will be full pink and that’s how we differentiate between these beans. But ppl say that there are so many colors and variants in these beans. 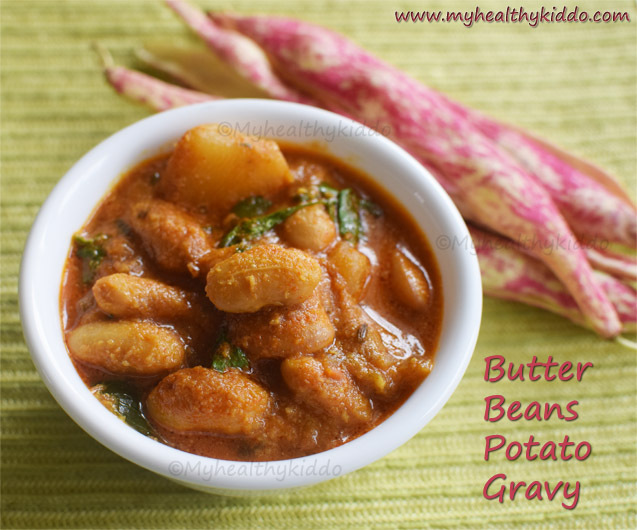 I saw a mix of butter beans and soya beans (that I have used in this recipe) in Saraga International groceries in USA. The taste matched the butter beans that we get in our hometown. Happy me !! 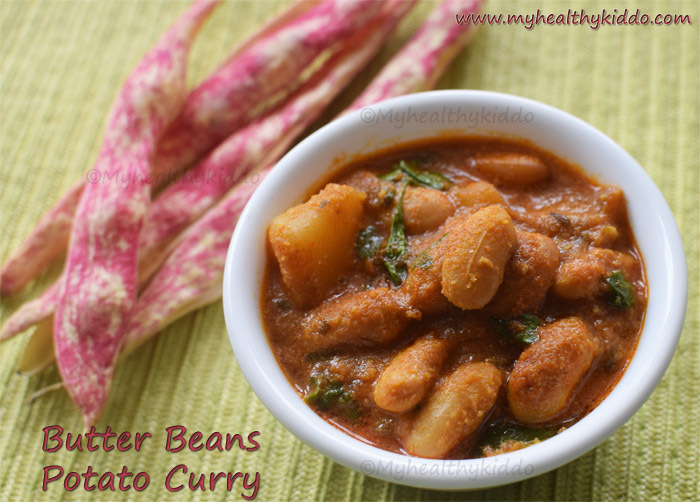 If you could get butter or soya beans, then try this recipe with it. Else, you shall replace butter beans with other veggies or pulses(see notes section below for details). Very simple but delicious gravy recipe that goes well with rice, idli, dosa, chapathi, idiyappam, aappam. Peel off the skin and separate the butter beans. Wash the beans. Peel off a potato skin, cut into cubes. Add 1.5 cups of water, chopped potato and butter beans in a pressure cooker. Pressure cook for 2-3 whistles in medium-high flame..I cooked for 3 whistles. Wash tomato, few curry leaves and coriander leaves. Peel one onion. Chop onion, tomato and coriander leaves. In a dry pan, add a tbsp of oil. Once hot, add 1 inch cinnamon/pattai, 2 cloves/krambu, ½ tsp sombu/aniseed. Once sombu slightly starts to change color, add chopped onion. Add ¼ tsp rock salt(or kosher salt) and fry till onion starts to change color. Then add ½ tsp ginger-garlic paste. Fry in low flame till raw smell leaves(or 1 min). Add chopped tomato and fry in medium flame till oil separates. Add 2 tsp Coriander powder, 1.5 tsp or more chilli powder, ¼ tsp turmeric powder and fry in low flame for few seconds(20 secs). Using perforated ladle(with holes), take the cooked butter beans and potato (save the cooked water for later use) and add it to the pan. Gently stir till it coats well with masala. Then add the cooked water to the pan. Add 1 more cup of water and 1 tsp rock salt. Boil for 10 mins in medium-high flame with lid closed. In the meanwhile, grind ½ cup loosely packed grated coconut in mixie along with ⅓ cup water. Add ground coconut to the gravy. Use ¼ cup water to rinse mixie jar and pour it in the gravy. Cook for 5 to 10 mins in low-medium flame until desired consistency is reached. Garnish with chopped coriander leaves and switch off. 2.Add ½ tsp extra chilli powder if u prefer lil spicy..
3.Spice powders can be replaced by my magical sambar/curry powder. Click here for link. 4.Ginger-garlic paste is optional. If unavailable, just add 4 crushed garlic. 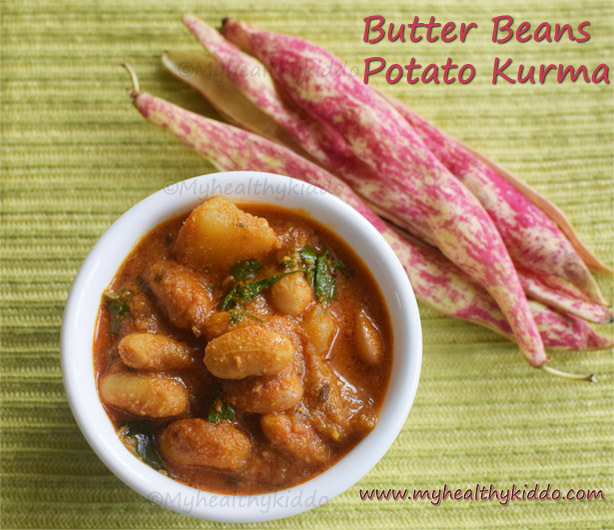 butter beans kurma recipe – How to make butter beans kurma ? 1.Peel off the skin and separate the butter beans. 2.Wash the beans. Peel off a potato skin, cut into cubes. Add 1.5 cups of water, chopped potato and butter beans in a pressure cooker. 3.Pressure cook for 2-3 whistles in medium-high flame..I cooked for 3 whistles. Wash tomato, few curry leaves and coriander leaves. Peel one onion. 4.Chop onion, tomato and coriander leaves. In a dry pan, add a tbsp of oil. Once hot, add 1 inch cinnamon/pattai, 2 cloves/krambu, 1/2 tsp sombu/aniseed. Once sombu slightly starts to change color, add chopped onion. 5.Add 1/4 tsp rock salt(or kosher salt) and fry till onion starts to change color. Then add 1/2 tsp ginger-garlic paste. 6.Fry in low flame till raw smell leaves(or 1 min). Add chopped tomato and fry in medium flame till oil separates. 7.Add 2 tsp Coriander powder, 1.5 tsp or more chilli powder, 1/4 tsp turmeric powder and fry in low flame for few seconds(20 secs). Using perforated ladle(with holes), take the cooked butter beans and potato (save the cooked water for later use) and add it to the pan. 8.Gently stir till it coats well with masala. Then add the cooked water to the pan. 9.Add 1 more cup of water and 1 tsp rock salt. Boil for 10 mins in medium-high flame with lid closed. In the meanwhile, grind 1/2 cup loosely packed grated coconut in mixie along with 1/3 cup water. 10.Add ground coconut to the gravy. Use 1/4 cup water to rinse mixie jar and pour it in the gravy. 11.Cook for 5 to 10 mins in low-medium flame until desired consistency is reached. Garnish with chopped coriander leaves and switch off. 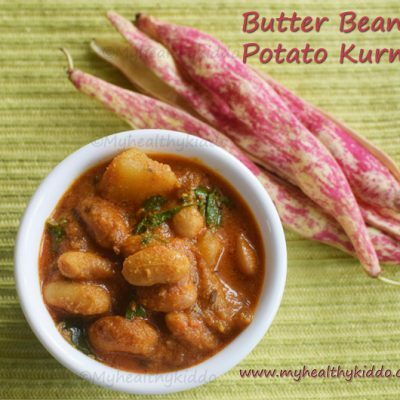 Delicious butter bean kurma is ready. Relish with rice, idli, dosa, chapathi, idiyappam, aappam.. So yumm..
Add 1/2 tsp extra chilli powder if u prefer lil spicy..
Spice powders can be replaced by my magical sambar/curry powder. Click here for link. Ginger-garlic paste is optional. If unavailable, just add 4 crushed garlic.